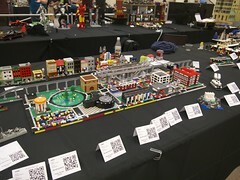 As I have done every year since 2008, I went to BrickCon (the LEGO convention in Seattle, Washington) again this year. Here is my trip report. I left home Wednesday morning, October 2nd, around 10am. I live in El Cerrito, California, which is near Berkeley, and it’s about 16 hours drive to Seattle from there if done in one step. However, that’s more driving than I can do in a day, so I need to spend the night somewhere along the way. I drove all day and got about halfway through Oregon by the time I decided to find a place to sleep for the night. 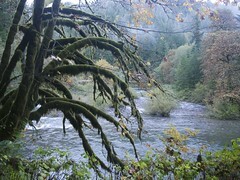 I camped in my van along a forest road in Willamette National Forest, just east of Sweet Home, Oregon. As it was pouring down rain, I had to set up my bed without the benefit of opening the doors and going outside. I was ferrying a bunch of boxes of merchandise for Miguel Monje (one of the vendors at BrickCon who is based in the bay area and often sells at BayLUG meetings), and had to rearrange the load to make room for my cot. Unfolding the cot in those tight confines was a challenge, but I finally got it open, and though I wasn’t able to get the foot of the bed locked open it was good enough to sleep on. I set up my sleeping bag and turned in for the night. However, it was only 8pm, and though I was really tired, I wasn’t actually all that sleepy. I read a few of the Sherlock Holmes stories on my iPad, and after an hour or two I was able to sleep. In the morning, the sun was out and the light through the moss-covered trees was beautiful. The road back to the Interstate went through some lovely small towns and by a lake (reservoir) that was really scenic in the morning light. I took a few pictures along the way, which were the only photos I took the entire trip, apart from the LEGO convention itself of course. I stopped in Portland for breakfast and did some shopping. I had a delicious vegan waffle at my favorite Portland food cart, Flavour Spot, with fried chicken as a “Dutch taco.” After that I headed to downtown and went to Powell’s Books. I lucked out and found a parking space on the street just across from the main entrance to the store. I picked up some Kim Stanley Robinson books and Storm Front: Book one of The Dresden Files by Jim Butcher. On my way out of town I swung by Voodoo Doughnut and got some fuel for the final push to Seattle. When I got to BrickCon, I met up with Miguel and unloaded his stuff and my LEGO models at the loading dock, then parked my van and went in to set up Kermit and my Micropolis display. After reconnecting with a few LEGO friends, I went over to where I would be staying, the home of a friend I met dancing a few years ago. We went out for Japanese food and she busied herself prepping for her trip – she was ironically enough going to be spending the weekend in the bay area, so I would have her house to myself until she returned Monday. In the morning I met another friend for an early lunch, then headed to BrickCon just in time for the opening ceremony. I was in Seattle this weekend for two events – besides BrickCon, there’s also a dance convention (Seattle Fusion Festival) that I was attending. They had dance classes all afternoon on Friday through Sunday, but because of the distance between where they are held and BrickCon I had to choose between them and BrickCon, and I chose LEGO. Last year when I attended both events, the dance classes were held right there at Seattle Center, and it was easy to bounce back and forth between the two events, but this year I wasn’t so lucky. However, when I registered for the dance weekend, I had a super early bird discount, which was only $10 more than the dance-only pass, so missing all those dance classes didn’t cost me much, and as you’ll hear later on, I did make it to one dance class on Sunday. But in the future if these events are held the same weekend, I will probably just sign up for the dance-only pass and opt out of all the dance classes. So after the ceremony, I signed up for several activities at the convention, and participated in the Bag Build and Master Build contests. For the Bag Build, we had to assemble a small LEGO set with all the parts placed inside a Ziploc quart bag. That’s always a difficult challenge, but this one was particularly bad as it was such a small bag. The Master Build was also quite challenging – the theme was Pigs vs Cows, and we were given 3 sets to open up and use all the parts, plus two pig heads and two cow heads, but we had to do it in teams of two. I teamed up with a teenager named Gus, and we came up with a pigs vs cows podrace scene, with the cow’s podracer crashed. It didn’t win, but the team next to us did. There were also three entries built by LEGO designers in Denmark and placed among our entries, but those didn’t even come close to winning according to the judges. But with both these games, even though I didn’t win, I scored plenty of free LEGO, and that’s the point! After that was over I joined some California LEGO builders for dinner back at the hotel where they were staying. When we finished dinner, I put my leftovers in the car and we all walked back over to the convention for the evening ceremonies and keynote speeches. There were two speakers: David Robertson, author of Brick by Brick: How LEGO Rewrote the Rules of Innovation and Conquered the Global Toy Industry , a business history of the LEGO company, who talked about the incredible comeback from crisis and recent incredible growth of the company sales; and Hillel Cooperman, a local fan who has been giving keynote speeches at BrickCon for several years, who cautioned that LEGO is completely missing out on the 3D printing revolution and being eaten alive online by Minecraft. There was also a new set unveiled, the Parisian Restaurant, which has some awesome new parts and details. The designer, Jamie Berard (featured in that video), was on hand to talk about it and after the ceremony was over I spent some time in a small group going over some of the details and hearing insider tales of LEGO designers, and walked and talked one-on-one with him back to the exhibition hall, where he went inside while I left to go dancing. I drove over to the Seattle Fusion Festival and finally checked in and got my wristband, and danced until 2am. One of the key highlights was when my friend Emily Zisman was on stage singing as a part of the band Chance’s End. That was a great performance and the dancers seemed to really enjoy it. A couple of my bay area dancer friends, Reeva and Jasmine, did a “DJ battle” as well. I didn’t know many of the dancers, but recognized a few from the bay area and met a few nice locals. The dancing continued until 5, but I needed to get to bed as I had to give my “Brick Geometry” presentation in the morning. In the morning I had to pick up some of my models to use as props for my talk. I had brought my Caltrain locomotive and lunar school bus, and had built special for this talk a truss bridge and some Pythagorean triangle examples. These were all in a box in the exhibition hall, so I needed to get in there, preferably before they let the public in, and grab those as well as the Micropolis hospital, and take them up to where the talk would be given. They announced on the PA that the public was coming in at 10am, right as I was picking up this stuff, so I timed it pretty thin. I hurried out before it got too crowded and went up the hill, found my room and set up my props. After giving my talk (which was pretty well attended, including Jamie Berard who is one of the LEGO model design managers), I met up with Gus (my partner from the Master Build competition) and we divvied the parts from the sets we had received. I got some take-out for lunch from a nearby market and took it back to the con and ate while picking out my parts for the “101 Bricks” game, which I then won! (I think that the final round gave me a bit of an advantage, with the theme of “Golden Gate Bridge” … I built a studs-down model in brown and dark green: wrong colors, but it had the right silhouette.) The next event I attended was a talk by Jamie Berard where he explained the process and particular challenges of designing the Sydney Opera House set. It was a fascinating look behind the scenes, and it’s an amazing set that I’m looking forward to building. From there I went down to the exhibition hall to put my props back where they had been (now that the public had gone home). I went to my car and swapped my laptop for my camera, and started back to take pictures of models, but saw some friends (and LEGO employees) heading into the hotel restaurant so I followed and joined them instead. The restaurant couldn’t accommodate us all as one group, so we broke up into two groups of six and sat down. The two LEGO reps in the group, Jamie and Kevin, each stayed with one group. 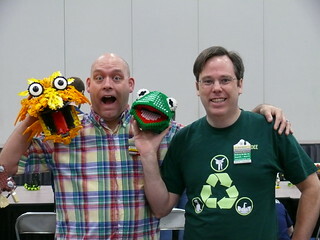 Kevin Hinkle, the LEGO fan liaison for the Americas, was in my group, and we talked Bricks by the Bay business a lot. Wayne Hussey (the guy who runs BrickCon) and his wife walked in as we were all eating, and I bade them join us. After dinner we all went up to the meeting rooms for the award ceremonies. They announced the winners of all the various speed builds, but somehow didn’t include 101 Bricks in the results unfortunately. However when they announced the winners in Microscale, I was pleased to learn that my train station was selected as the “Size Matters: Building” winner. I got a nice little trophy as a prize. When the ceremony was over, I went back to the exhibition hall and finally started taking pictures. With a brief stop in the middle to go transfer the photos to my laptop, I got almost all of the picture-taking done but my camera battery died, so I still had to go back in the morning to get pictures of a few more things. I went dancing again, this time staying until 1am, and went back to my friend’s house to sleep. Sunday morning was the last day of both BrickCon and the Fusion Festival, and I finally made it to a dance class! But first, the night before I had a few pictures left to take of the LEGO models since my camera battery died, so I charged it up overnight and went during the public hours to finish the job. I was able to get around and take pictures over people’s shoulders or to squeeze between people. Once that was done I headed up to the breakout rooms for the sorting and storage roundtable. This was a really good discussion of the ways people sort and store their parts. I didn’t get much out of it in terms of ideas I could use, but I shared my recent color sorting changes and discussed the containers I use for storage. One idea that I may try is to use storage containers intended for beading to store Technic axles, as you can apparently customize the sizes of the compartments by removing the inner walls in a way that is much more suitable to LEGO than the fishing tackle boxes I had tried a few years back. It was fascinating to see how different people approach the problems of organizing their collections. I also talked to the guy who was moderating it about having him come to BBTB and run a military theme. I gave him a business card and he said he might be interested. I walked back to the exhibition hall and hung out in the Microscale area for a while, and then left to go to catch the one dance class I had room in my schedule for. The dance class was on micro dancing, which is basically holding still with your partner and using breath and upper body isolations to dance rather than moving about. We did exercises involving things like dancing for 2 minutes without shifting your weight or taking a step. I’d done that kind of thing before, and it’s really nice, and a wonderful peaceful way to wrap up a weekend of activity. After that one class, however, I couldn’t stick around for more as I had to return to BrickCon for teardown and closing ceremonies. I packed up all my models into their boxes, and as soon as they opened up the loading dock at 5pm I got my van and drove it around to the back of the building. I loaded my stuff into the van and parked it, then went back to the exhibition hall to hang out with people for a while. Eventually a group of us went out for dinner and then to the hotel lobby to play Cards Against Humanity . After the hilarity had ended, we all parted ways and I drove off to the dance. At the dance I had some wonderful dances, including an epic polka that was Ted Maddry’s last song – he even announced that people should clear a lane for the polka dancers. I made some new Facebook friends and had some nice conversations as well as great dances, and left around 3am. Monday morning, I went to the LEGO store in Bellevue with a LEGO friend from England who needed to stock up on LEGO Star Wars sets, and while I was there I got a Pick-A-Brick cup, and noticed they had some sets on sale, so I stocked up on them as prizes or speed-build fodder for Bricks by the Bay 2014. Ed and I had lunch, and then I did some thrift shopping and went back to my friend’s house. She had returned from her trip, and we went out for Thai food and had a pleasant evening catching up. In the morning my friend took me for breakfast, and then I loaded up my van and hit the road. It had been raining a little all morning, but it got worse as the day went on. There was plenty of thunder and lightning, and when I was just south of Tacoma there was a lightning bolt very close by, where the thunder actually shook the van! It felt like a boulder being dropped on the back of the van from a great height. I suspect it was cloud-to-cloud lightning directly above me, as there was some delay (though not much) between the flash and the boom, and the shock wave hit me so hard. The rain petered out by the time I got to Oregon though. In Portland I stopped at Voodoo Doughnut again for more yummies, of course, and then went to the LEGO store. Since LEGO has discontinued the convention discounts this year, my only way to get discounts on exclusive items is to shop in Oregon where there’s no sales tax. I bought a few big items (including the Sydney Opera House) and while I was there I also picked up some of the sale items for Bricks by the Bay similar to how I did in Washington. As I mentioned at the top, it’s not realistic to expect me to make it from Seattle to home in one day, and I was hoping to make a stopover in Eugene at a dancing friend’s house, but she had to work late and wasn’t going to be able to get away even for dinner, so I decided to press on and see her some other time. I ended up sleeping in a rest area near Shasta Lake in northern California. I had bought so many LEGO sets (mostly for Bricks by the Bay) that my cot was covered in boxes of LEGO, and there was no way to keep my bed clear while driving, so I had to shift a bunch of them to the front seats to make room for myself to sleep! Wednesday morning, I ate my last Voodoo Doughnut for breakfast as I made my way south on I-5. Instead of going home though, I went straight to the Bricks by the Bay storage locker to unload the prizes and to my own to drop off camping supplies and other items. I finally got home in the early evening, not quite missing the rush hour traffic, and collapsed. You can see my pictures from BrickCon, as well as a few pictures I took near my campsite the first night, in my BrickCon 2013 Flickr set, which you can also view as a slideshow. Last weekend, I went up to Portland, Oregon for the first-ever Bricks Cascade LEGO convention. I had a real ordeal getting up there. I had standby tickets to fly up Thursday morning from San Francisco, but the flights were all full. I bought a one-way ticket using miles instead on another airline, and then realized that flight was out of San Jose! So I had to take two BART trains, a Caltrain, and a bus to change airports. I got to the airport in plenty of time, but the plane was late coming in… and after unloading the incoming passengers, they didn’t load us right away. After a while we finally heard the mechanic was looking into an oil pressure problem, and after an hour or two delay (during which another – full – flight to Portland took off without us), they canceled the flight. We had a choice to be put on a flight from Oakland – yet another airport – that evening, but I didn’t relish the idea of riding in a crowded shuttle bus in rush-hour traffic and told them to just cancel me and give my miles back. I decided to drive up instead… it’s about a 12 hour drive, and at that point (Thursday evening around 5) I thought I could make it up there by noon Friday and still enjoy the convention events. However, I didn’t get a ton of sleep the night before, and spending the entire day trying to fly wasn’t exactly restful. I didn’t quite make it to Redding before I started getting drowsy, so I pulled off in a rest area to take a nap. It was too warm to really sleep and I didn’t get more than a catnap before pressing on. I spent the night at a truck stop in Weed. I also took some rest breaks the next morning, and between all the sleeping, and a few stops for gas and munchies and stuff – oh, and I had to stop at a tire shop and buy two new tires for my van – I didn’t get into Portland until 5pm. I missed all the Friday activities at the convention, but at least I made it. I went to the airport and got my luggage (which made it on the first flight I missed), and went to my friend’s house where I’d be staying for the weekend, and collapsed into bed. My hay fever allergies had been acting up even before I left, but when I got up to Oregon, they really kicked into high gear. I was completely stuffed up, and had to take a Benadryl when I went to bed in order to sleep. I had to take plenty of allergy meds all weekend just to function, but I almost completely lost my voice anyway. As I write this Thursday evening, I still have a residual cough and my voice isn’t quite right. 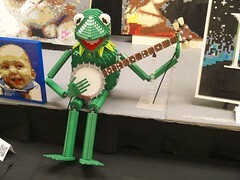 Saturday morning I checked in at the convention and set up Kermit before the doors opened to the public. I took a few photos, then went out for lunch (vegan waffle with fried chicken from the Flavour Spot food cart) and did my shopping at the LEGO store, then went back to the convention center. I took part in the team speed build event, where we formed four teams of six to put together the LEGO Tower Bridge #10214 set. My team finished last, but at least we got to divvy up the set and each keep 1/6 of the parts. At the award ceremony Saturday evening, they gave me a special “Planes Trains & Automobiles” award in honor of my travel misadventures, and Kermit won “Most Iconic” in the Art theme. After the ceremony I went out for dinner and Voodoo Doughnut with a couple friends, and then went back to my host’s house and to bed. Sunday, I spent the entire day onsite, except for a brief time away for lunch at Red Robin nearby. I took a lot of photos and spent time chatting with people. Overall, the attendance was fairly light for this event, but that is probably for the best their first year. I’m sure as the word gets out, they’ll have more crowds next time. I really enjoyed the relaxed atmosphere that a lighter density crowd brings. They closed the doors at 3, and had a brief closing ceremonies in which my name finally came up in the drawing and I got a Friends set. We packed up all our things and cleared out the hall. One unexpected surprise was another Toyota Sienna van with Oregon “I LEGO” license plates! Turns out, one of the local Play-Well people had a Toyota minivan with a license plate to match my California “I ♥ LEGO” plates. I spent the evening hanging out with my hosts and headed out in the morning, but did some shopping on my way out of town and didn’t really get on the road until after noon. I got home around 5am, after a few nap breaks. It was quite an ordeal of driving, and I really should stop trying to drive all the way to/from Portland by myself in one step. Road trips are so much easier if you drive no more than 6-8 hours per day. They’re better still if not preceded by a day struggling to get on board an airplane, though. Anyway, overall I had a great time and am looking forward to BrickCon in Seattle in October, and seeing what Bricks Cascade does for 2013! To see all my photos, click the image, or view a slideshow.